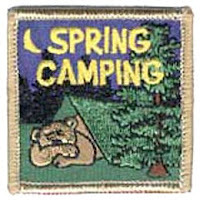 ﻿For spring camp, we tented at a local provincial campground. We didn't want to plan anything "extra" to do, other than camping activities. 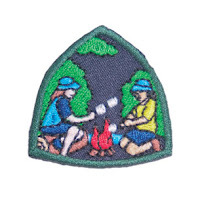 We planned for the girls to earn the Outdoor Adventure (OA) and Outdoor Cooking (OC) badges, along with the Basic Camper (BC) badge and a Spring Camping crest. We arrived at camp on Friday evening and all the girls helped to set up the tents. 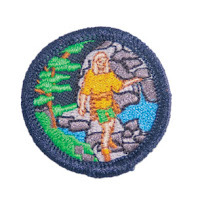 (BC#3) We invited the other Guide unit and the Pathfinder unit from our district, so we had 23 girls and 5 leaders. Then we played an icebreaker game I found on Becky's Guiding Resource Center called Part-to-Part. The leaders played too. I'm not sure we did the "move down and go the other line" part of the game quite right, but it was fun and there's nothing like getting into someone else's personal space to get to know them! If you’re lost, stay in one place because this helps people find you. Wear clothing appropriate to the weather, including footwear that will protect your feet and a hat to help prevent heat loss or protect you from the sun. The buddy system helps keep track of where people are during camp. During down times throughout the day, we played some Logic Games and Minute Mysteries. The girls loved these! We had great weather for the weekend, and I would say it was a successful camp!